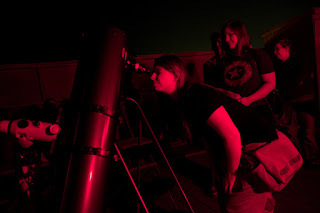 WHAT: The University of Illinois Springfield Astronomy-Physics Program and Lincoln Memorial Garden will host a special Star Party to view "Three Bright Planets and The Moon." DETAILS: This summer throughout the month of July, the bright planets Mars, Jupiter, and Saturn dazzle the evening sky. Beginning July 20 through the following week, the first quarter moon joins them to put on a spectacular show for people to see "Three Bright Planets and The Moon" in the evening sky. Come any time between 9 and 11 p.m. to see the show through the telescopes and take guided tours of the summer sky. This event will be cancelled for cloudy weather and rescheduled for the same time Saturday, July 21. Questions about suitable weather viewing should be directed to 217/206-8342 after 7 p.m. on July 20. Updates will also be posted on the UIS Observatory Twitter feed (@UISObservatory).